2 new Injustice 2 characters will be announced on the panel. Among the panelists is also Injustice: Gods Among Us Comic book writer Tom Taylor. The actors, who portray Superman, Aquaman and Supergirl will be present. Some secret, surprise panelists will also be there. Host of the panel will be Victor Lucas. We are very excited about this years’ San Diego Comic Con and hope that it will bring us a lot of new information about the game. We are also excited to learn what Tom Taylor is doing there. We hope he is co-writing the story for the game or may be launching the Injustice 2 comic book series that will hopefully fill the gap between Year 6 (Injustice: Gods Among Us) and Injustice 2. The panel will take place on Friday July 22, 2016 12:30pm – 1:30pm. Get a Comic-Con International exclusive look at Warner Bros. Interactive Entertainment’s Injustice 2, the super-powered sequel to the hit game Injustice: Gods Among Us. 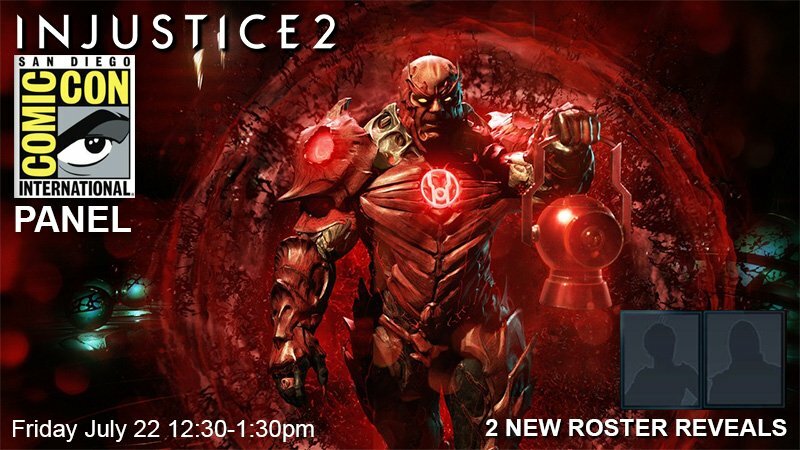 The newest game in development from the award-winning NetherRealm Studios features the largest roster of DC Super Heroes and Super-Villains ever offered, allowing players to build and power up the ultimate version of their favorite DC characters. Battles will take place across arenas that have evolved in scale and span across iconic locations such as Metropolis, Gotham City and Atlantis. Join panelists Ed Boon (creative director, NetherRealm Studios, and co-creator of Mortal Kombat), New York Times best-selling author Tom Taylor (Injustice: Gods Among Us) and a stellar group of actors – George Newbern (Scandal) as Superman, Phil LaMarr (MadTV, Futurama) as Aquaman, Laura Bailey (Uncharted 4: A Thief’s End, LEGO Dimensions) as Supergirl – and possibly some surprise guests as they reveal exciting new gameplay and discuss new features and breakthrough customization aspects that expands on the previous title’s larger-than-life showdowns of DC Super Heroes and Super-Villains. Also to be discussed: the bestselling Digital First Comic – Injustice: Gods Among Us. Injustice 2 will be available for the PlayStation®4 computer entertainment system and Xbox One in 2017.
Who do you expect to be announced during the Injustice 2 San Diego Comic Con panel, tell us in the comments below.